If you’ve been keeping tabs on recent developments in robotics, you surely remember Handle — the awesome walking, wheeled robot from Boston Dynamics. There’s a good reason why such a combination is a good choice of locomotion for robots. Rolling on wheels is a good way to cover smooth terrain with high efficiency. But when you hit rocky patches or obstacles, using legs to negotiate these obstacles makes sense. But Handle isn’t the only one, nor is it the first. [Radomir Dopieralski] has been building small robots for a while now, and is especially interested in how they move. He is sharing his experience while Experimenting with Wheeled Legs, with the eventual aim of “building an experimental walking+rolling robot, to more efficiently kill all humans and thus solve all the problems”. His pithy comments aside, investigating and experimenting with different forms of locomotion to understand which method is most efficient will pay rich dividends in the design of future robots. During an earlier version of the Hackaday Prize, [Radomir] snagged a coupon for laser cutting services. He used it to build a new robot based on a fresh look at some of his earlier designs. This resulted in the Logicoma-kun — a functional model of a Logikoma (a logistics robot designed to be a fast all-terrain vehicle for transporting weapons and ammunition) from “Ghost in the Shell: Arise”. Along the way, he figured out how to save some servo channels. For gripping function, he needed to drive two servos in sync with each other, but in opposing directions. This would usually require two GPIO’s and a few extra lines of code. Instead, he dismantled a servo and reversed the motor AND the servo potentiometer connections. But this is still early days for [Radomir]. He is fleshing out ideas, looking for feedback and discussions on robotic locomotion. This fits in perfectly with the “Design Your Concept” phase of the Hackaday Prize 2017. He has already made some progress on Logicoma-kum by having it move in either the wheeled or walking modes — check out the videos after the break. I start each day checking out the new and updated projects over on Hackaday.io. Each day one can find all manner of projects – from satellites to machine vision to rockets. One type of project which is always present are robots- robot arms, educational ‘bots, autonomous robots, and mobile robots. This week’s Hackaday.io had a few great robot projects show up on the “new and updated” page, so I’m using the Hacklet to take a closer look. We start with [Jack Qiao] and Autonomous home robot that does things. [Jack] is building a robot that can navigate his home. He’s learned that just creating a robot that can get itself from point A to point B in the average home is a daunting task. To make this happen, he’s using the Simultaneous Localization and Mapping (SLAM) algorithm. He’s implementing SLAM with the help of Robotic Operating System (ROS). The robot started out as a test mule tethered to a laptop. It’s evolved to a wooden base with a mini ITX motherboard. Mapping data comes in through a Kinect V2, which will soon be upgraded to a Neato XV-11 LIDAR system. Next up is [Tyler Spadgenske] with TyroBot. TyroBot is a walking robot with some lofty goals, including walking a mile in a straight line without falling down. [Tyler’s] inspiration comes from robots such as Bob the Biped and Zowi. So far, TyroBot consists of legs and feet printed in PLA. [Tyler] is going to use a 32 bit processor for [TyroBot’s] brain, and wants to avoid the Arduino IDE at any cost (including writing his own IDE from scratch). This project is just getting started, so head on over to the project page and watch TyroBot’s progress! Next is [Mike Rigsby] with Little Friend. Little Friend is a companion robot. [Mike] found that robots spend more time charging batteries than interacting. This wouldn’t do for a companion robot. His solution was to do away with batteries all together. Little Friend is powered by super capacitors. An 8 minute charge will keep this little bot going for 75 minutes. An Arduino with a motor shield controls Little Friend’s DC drive motors, as well as two animated eyes. If you can’t tell, [Mike] used a tomato as his inspiration. This keeps Little Friend in the cute zone, far away from the uncanny valley. Finally we have the walking robot king, [Radomir Dopieralski], with Logicoma-kun. For the uninitiated, a Logicoma is a robot tank (or “logistics robot”) from the Ghost in the Shell series. [Radomir] decided to bring these cartoon tanks to life – at least in miniature. The bulk of Logicoma-kun is built carefully cut and sculpted acrylic sheet. Movement is via popular 9 gram servos found all over the internet. [Radomir] recently wrote an update outlining his new brain for Logicoma-kun. An Arduino Pro Mini will handle servo control. The main computer will be an ESP8266 running Micropython. I can’t wait to see this little ‘bot take its first steps. If you want more robotic goodness, check out our brand new mobile robot list! Did I miss your project? Don’t be shy, just drop me a message on Hackaday.io. That’s it for this week’s Hacklet, As always, see you next week. Same hack time, same hack channel, bringing you the best of Hackaday.io! Every now and then someone gets seriously inspired, and that urge just doesn’t go away until something gets created. For [Paulius Liekis], it led to creating a roughly 1:20 scale version of the T08A2 Hexapod “Spider” Tank from the movie Ghost in the Shell. As the he puts it, “[T]his was something that I wanted to build for a long time and I just had to get it out of my system.” It uses two Raspberry Pi computers, 28 servo motors, and required over 250 hours of 3D printing for all the meticulously modeled pieces – and even more than that for polishing, filing, painting, and other finishing work on the pieces after they were printed. The paint job is spectacular, with great-looking wear and tear. It’s even better seeing it in motion — see the video embedded below. 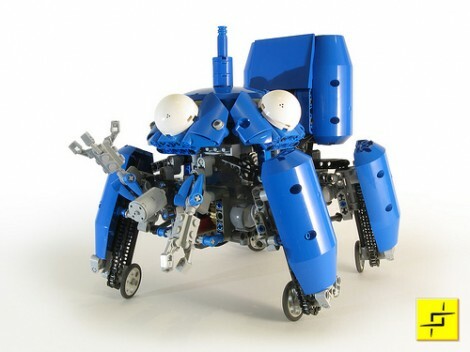 This Lego Tachikoma drives and walks just like in the TV program. You simply must take a peek at the video after the break. We’ve watched it several times and don’t think there’s any editing magic going on. But the movements are so intriguing part of us thinks there’s something fishy about it. Each leg has a wheel that is connected to a motor via chain drive. But the little guy isn’t constrained to smooth hard surfaces. When the going gets rough, he struts his stuff like an eight-year-old crossing the lawn in roller skates. This is not just for show and you can build it yourself if you like. The link at the top has assembly instructions. You will need several specialized parts though, not the lest of which is the cement mixer drum halves that make up the rounded blue chassis pieces. Not sure what the heck this thing is? Don’t feel bad, you’d need to be a fan of Ghost in the Shell to recognize it. The Laughing Man is the antagonist from the anime series Ghost in the Shell: Stand Alone Complex. During each of his public appearances in the series he manages to hack all video feeds/cyborg eyes in the vicinity to obscure his face with the logo above. [Ben Kurtz] had been watching the series recently and realized he could put together a similar effect using Processing. The interesting bit, and what makes this more fun than a simple demo, is that he’s using the OpenCV library. OpenCV is a open source computer vision library. [Ben] uses it to handle the facial recognition in Processing and then apply the image. It’s only 100 lines and we wonder what other fun tricks could be employed. Here’s a Hack a Day skull you can swap in for the logo. Scott Swaaley has added a new log for Grinder Minder. the_3d6 liked pcbtc (GaN edition). F1Nn liked FunKey project - All your games on your keychain !. zzz liked FunKey project - All your games on your keychain !. zzz liked Vintage film viewers as RetroPies. RichardCollins wrote a comment on flow : enhances reading experience. Ken Yap wrote a comment on project log Data Type Sizes and Memory Access. Mechanical Advantage has added a new log for Ternary Computing Menagerie. alunmorris liked Vacuum tube single digit calculator.